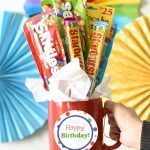 A Peek at the Fun: Whether it’s for a birthday, a holiday or some other fun celebration, a candy cake is a fun gift for anyone! 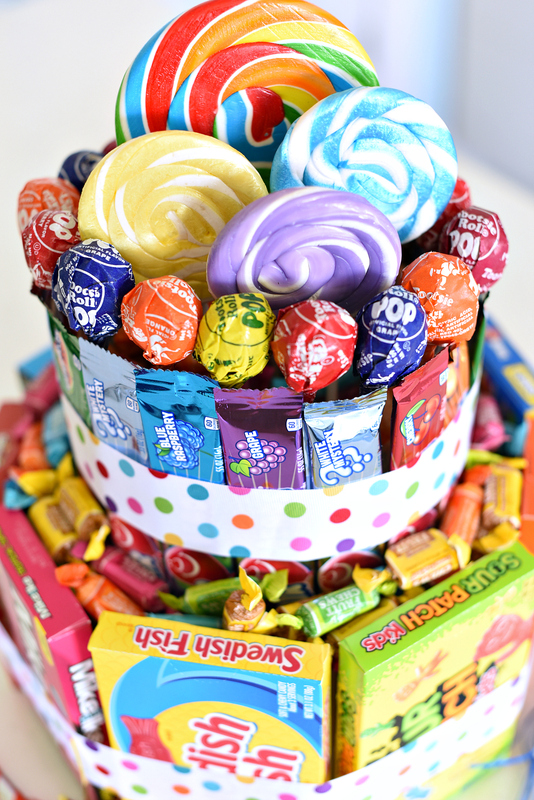 Fill several cake layers with bright colored candies to make a festive and fun cake that the recipient can eat! Sometimes you need a creative idea for a birthday or special occasion-something outside the normal. 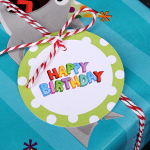 Maybe for the person who has everything or something to surprise a friend on a special day. 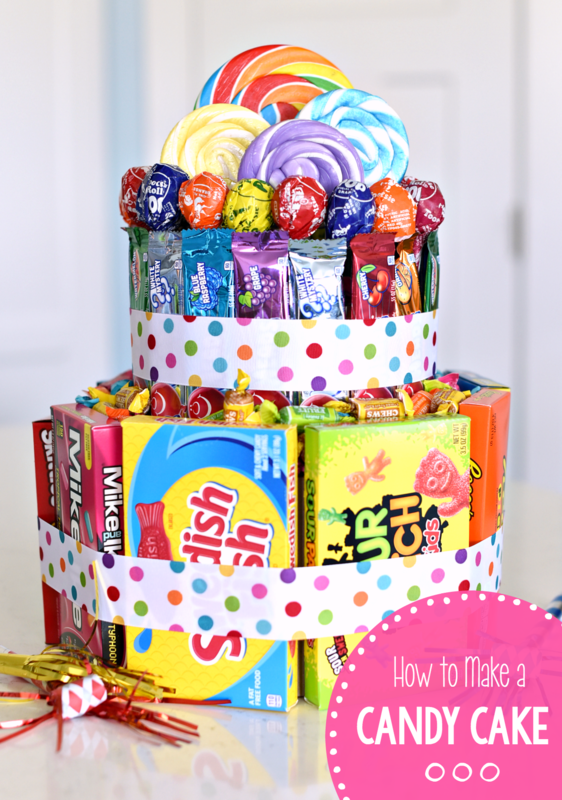 This candy cake is fun to put together and turns out fabulous! Who wouldn’t want to receive one of these! 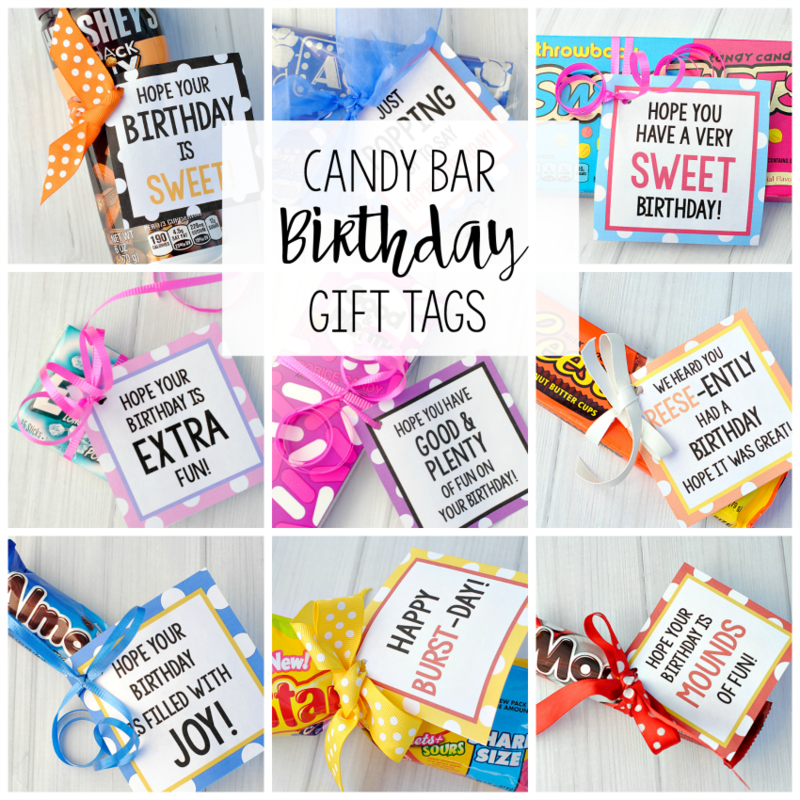 And you can even customize it for anyone and add the kind of candy they love! This candy cake would also work great as a thank you gift or something fun for teacher appreciation. Also, we’ve got a chocolate candy cake version now too if chocolate is more your thing! This is pretty straightforward to put together this candy cake. Here’s how. Begin hot gluing candy around the bottom layer (your larger hat box) so that the bottom of the candy box is flush with the bottom (which is actually the top since you have it upside down) of your hat box. Glue all the way around. 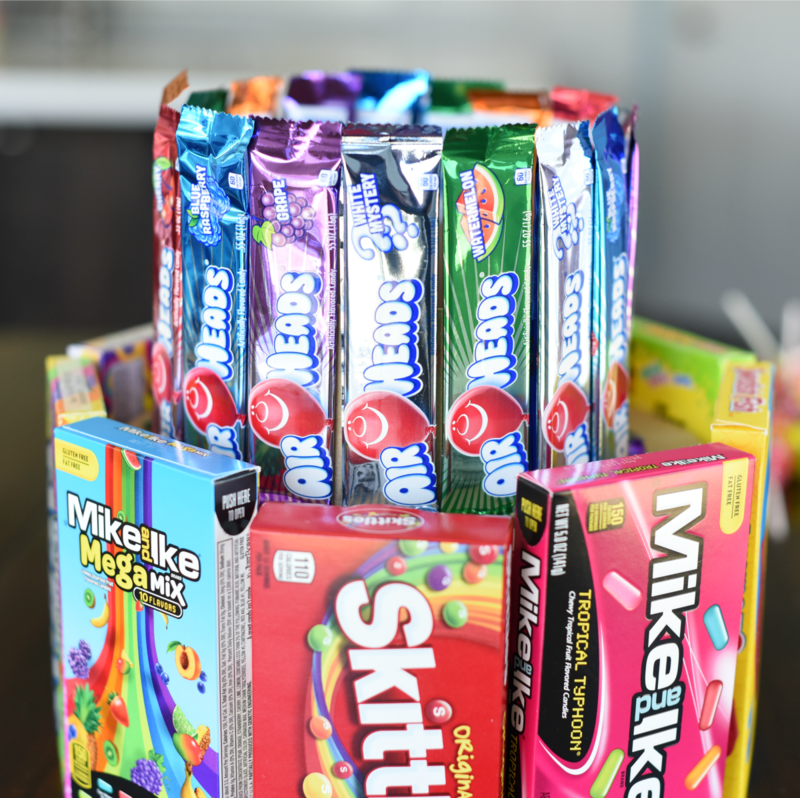 Do the same thing with the candy for the second tier but make sure that your box is right side up so that the opening faces up. You will fill this later. We used Airheads and they worked great but you can use anything you want. If you choose chocolate, just be careful not to melt it with the hot glue. After adding the Airheads we glued the Tootsie Pops to the inside of the smaller hat box all along the edge, behind the Airheads. Place the second tier on top of the first. Hot glue it in place if you’d like to keep it stable. Then we placed the floral foam down into the box and added the lollipops but sticking the sticks in there. Finish it off by putting your filler candy down into the open spots-between the two layers and in the top around the lollipops. 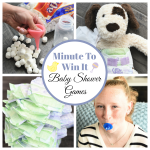 How fun does that turn out?! Does it make you want to eat all the candy? Have FUN making this candy cake! I love this idea, especially for my son who is allergic to cake. Approximately what size are the hat boxes? Sorry, we should have put that in the instructions-7 inches and 9 inches.